Our fleet of bikes, cars, vans and trucks allows us to efficiently work with every type of business--spanning all industries. Our corporate culture mandates personal accountability for each delivery--large or small, one piece or hundreds of pieces. Our professional logistics staff are highly dedicated and committed to making sure deliveries arrive on time and undamaged. 24/7, 365 Days A Year, We Deliver Important, Time Sensitive Materials Across The Maryland, Virginia and DC Regions. 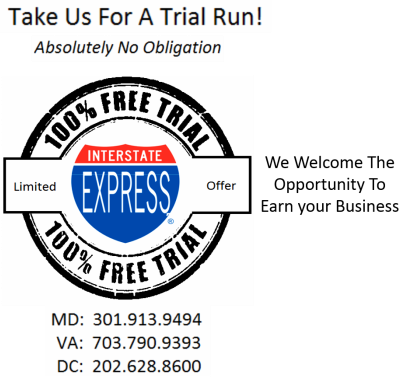 Since 1992, Interstate Express has been a leading 'on-demand' same day delivery service in the DC Metro area. Our talent for quickly adapting to changing business needs, has allowed us to create strong service partnerships with fortune 500 companies, medium to small businesses, and home-based entrepreneurs. Our 22 years of dependable service brings peace-of-mind to our clients. When You Are On Deadline, And Every Minute Counts, You Can Depend On Interstate Express To Deliver!